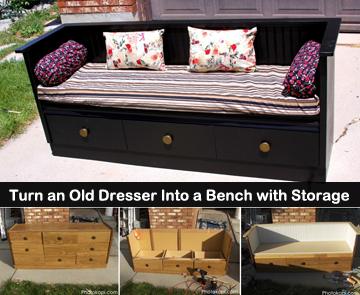 When an old piece of furniture has outlived its usefulness, it takes some creativity to find a way to upcycle it instead of throwing it away. That’s exactly what this project is about. An old dresser, or chest of drawers, got to where the drawers wouldn’t work well and it was no longer needed for that purpose. Instead of tossing it, Geoffrey from Photokapi turned it into a nice bench with storage that now sits in the front entryway to his home. He cut off the top of the dresser and took out the first 2 rows of drawers. After adding a frame on top of the bottom row of drawers and putting fiberboard on top of it, he put wainscoting around the back to finish the inside and have something to lean against. A top rail and some fresh paint and it was ready to be used as a beautiful bench. 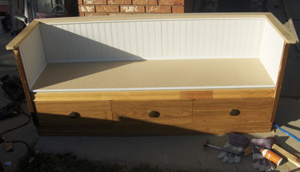 With cushions, it looks very inviting and it has the addition of the three drawers on the bottom for storage. 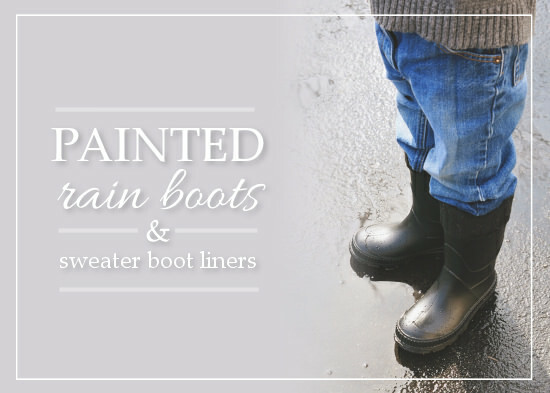 Obviously it needs to be in a protected area from the weather, like on a covered patio or else inside the home. You can see each step of Geoffrey’s project at Photokapi. 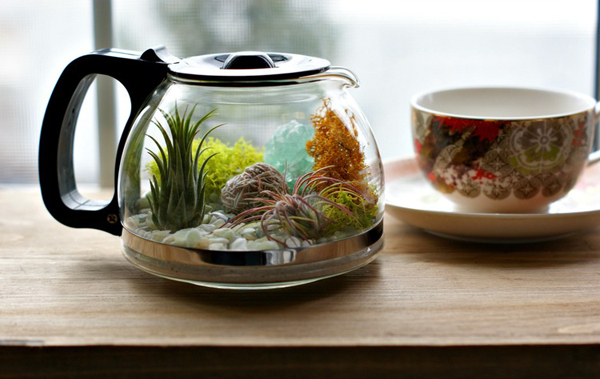 Make a Terrarium – In a Coffeepot!